As the birthplace of America, Philadelphia knows how to shine. Fireworks blazing over the Philadelphia Museum of Art are a Fourth of July tradition during Philadelphia’s multi-day Wawa Welcome America bash. Timed perfectly with exhilarating live music, the fireworks paint the skies over the Benjamin Franklin Parkway. The nation annually celebrates Fourth of July with grand fireworks shows. In Philly this year, the Wawa Welcome America festival will feature more fireworks than ever before. Of course, many Philadelphians choose to spend the holiday weekend at the Shore and view fireworks from the boardwalk. Whether staying in Philly from June 30 through July 4 or sitting beachside, check the guide below for fireworks show times. We've also included info on Wawa Welcome America and popular outdoor spots for those hanging in the city over the weekend. Fireworks in Ocean City, NJ. Atlantic City, NJ - There will be two fireworks shows on July 4 in Atlantic City. The first will be at the Borgata in the Marina District at 9 p.m. The second show will be at the Tropicana at 10 p.m.
Asbury Park, NJ - Look for fireworks from the boardwalk at 9 p.m. on July 4. Avalon, NJ - Around 8:45 p.m. fireworks will go off at 30th Street beach on July 4. Before, beginning at 7 p.m., there will be a free concert. Those in Avalon can also catch the boat parade in the bay. It starts at 4:30 p.m. from the Avalon Yacht Club. Camden Freedom Festival - Head to the Camden Waterfront at Wiggins Marina for the Freedom Festival, which begins at 5 p.m. There will be a salute to the veterans, live music, food vendors and a beer garden. The Wawa Welcome America fireworks show will begin at 9:30 p.m. over the Delaware River. Cape May, NJ - The fireworks show at Congress beach will take place on July 4 at 9 p.m.
Margate, NJ - Fireworks will be launched from Huntington Avenue beach around 9 p.m. 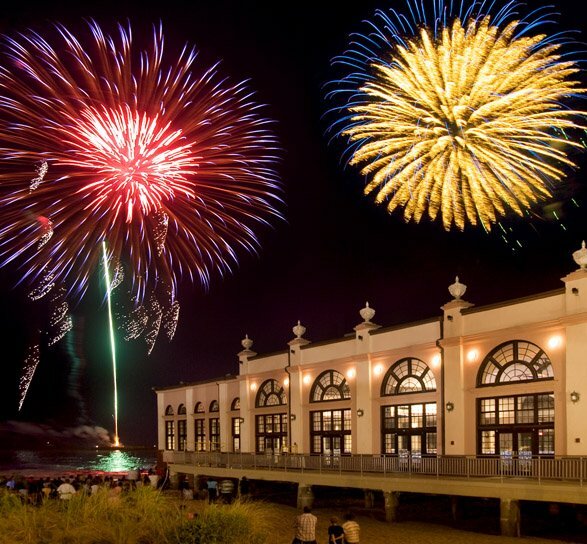 Ocean City, NJ - The Fourth of July fireworks display in Ocean City will begin when it gets dark – approximately 9:15 p.m.
Penn's Landing - There will be fireworks on June 30, July 1 and July 4 at 9:30 p.m. over the Delaware River waterfront. The shows are part of Wawa Welcome America. 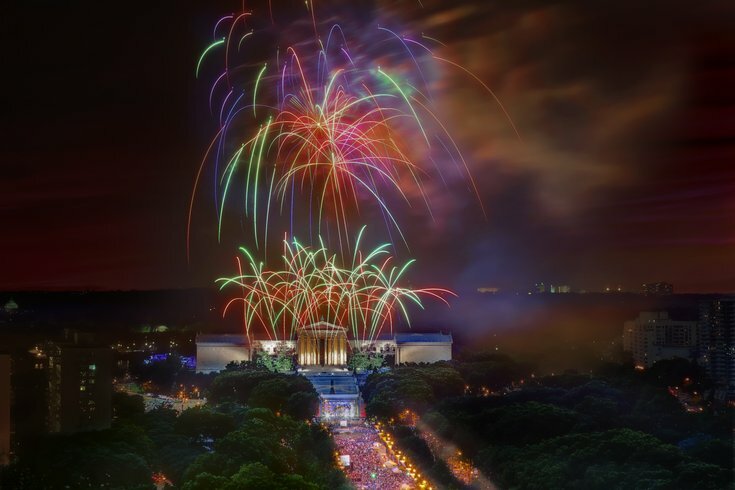 Philadelphia Museum of Art - On the Fourth of July, there will be fireworks at the Philadelphia Museum of Art at 9:30 p.m. The show is part of Wawa Welcome America. Sea Isle, NJ - The fireworks display on July 4 will take place at 9 p.m. on 50th Street Beach. Stone Harbor, NJ - Fireworks are scheduled for Sunday, July 2 at 9:30 p.m. Before the fireworks show, there will be live blues and jazz music starting at 7:30 p.m.
Wildwood, NJ - Fireworks will be visible from almost anywhere on the Wildwood boardwalk on July 4 at 10 p.m. The six-day festival will take place on Thursday, June 29 through Tuesday, July 4. There will be 50 free events during the celebration in Philadelphia. There are plenty of new experiences for 2017, but the popular traditions – like free museum admissions, free concerts, and free movie screenings – will still take place. As always, the annual Wawa Welcome America July 4th Concert on the Benjamin Franklin Parkway will end the six-day celebration. This year's headliners are Mary J. Blige and Boyz II Men. RELATED: All the photos you need to see from Philadelphia's unveiling of "Boyz II Men Boulevard"
Parks on Tap - Over Fourth of July weekend, traveling beer garden Parks on Tap will be at two parks. Head to Strawberry Mansion for a beer Wednesday, June 28 through Tuesday, July 4 or stop by Paine's Park through Monday, July 3. The pop-up beer gardens are family-friendly and dog-friendly. Wawa Welcome America's Culture on Tap (like Philly's traveling beer garden Parks on Tap) will pop-up from 4-9 p.m. at City Hall’s courtyard on Thursday, June 29, too. Spruce Street Harbor Park - The mini waterfront oasis, full of hammocks, lounge chairs, and colorful lights, is a popular destination in the summer. Attendees can play games, sip on beer and cocktails, enjoy ice cream, pizza, tacos and other foods or just sit back and relax. On July 2, there will also be a workshop at Spruce Street Harbor Park, where attendees can create personalized wine glasses or coffee mugs. Blue Cross RiverRink Summerfest - At Summerfest, there is a roller rink, 60-foot Ferris wheel, carousel, mini-golf, outdoor bowling, boardwalk-style games and plenty of space to lounge. Fishtown Hops - A new waterfront beer garden recently opened at SugarHouse Casino.